I love this bedspread set. It is oversized and not flimsy. Love the weight of it. Love the prints and the colors. Really dresses up a bedroom. Very pleased with this set. Add a touch of farmhouse charm to your home with the Greenland Home Fashions blooming prairie 3-piece bedspread set. Featuring a rustic, prairie-themed floral patchwork design, this excellent set is a charming touch of texture to any space. Click here to view related items. Not only do we have a 4 inch memory mattress on our bed, we also have it up on 6 inch risers. So-- finding a spread that is large enough was a big problem. This fits just right with my bed skirts and is very well made! Finally a bedspread that works! I have been looking for a bedspread for quite awhile. Anyone who has knows there's slim pickin's out there. This works on the bed beautifully. And I have a big king bed. Because of so many colors I decided to go with curtains in linen to compliment the walls. The room now looks cosy and comfortable, warm and inviting. I am very happy with this product. I ordered the bedspread instead of a King Quilt, and that was best. It covered the area I needed it to cover, vs. a King Quilt, which would have been too short in width. Nice bedspread for our mountain house. I could not be happier with this bedspread. This bedspread is large enough to cover our over-sized king size bed and falls within inches of the floor. No bedskirt is needed which is a huge plus and a great time saver when making the bed, changing sheets, etc. I was also very pleased that two king sized shams game with the bedspread. Many of the sets I had looked at only came with standard sized shams even with a king-sized bedspread. The colors are soft and varied; this bedspread should go with almost any color scheme. This set was beautiful! I had previously owned a Greenland Home quilt and used it for about 5 years. I upgraded to the larger bedspread and in a different color. The colors are beautiful and the size is great! You do not need a dust ruffle as it hangs below the bottom mattress but off the floor about 2 inches. I washed it in my front loader but I will take it to washeteria next time because it was too packed and my washer freaked out..lol but it washed and dried beautifully! After reading many reviews I decided to buy the king size bedspread. My bed is a queen but has a high bedframe and then I have a Sears serta gel top memory foam mattress and box springs which makes me almost needing a step to get into the bed so needless to say my other queen bedspreads don't work and trying to find a 21"-25" bedskirt is hard and expensive. So I got this kingsize spread and from the moment I put it on my bed I have loved it! It does hang all the way to the floor with some to spare but I feel after I wash it (will need to take it somewhere) it may shrink a little to make it a perfect fit but not unsightly as is. Until then it is great and hides the under bed storage boxes. The color is muted as stated by some but for me wanting that "older used feel" it works great and I don't feel the colors are that muted but just enough to make it look comfortable. It is heavier than what I thought it would be but since I am using a blanket under it could contribute to that. In a month or so it will be warm enough at night (desert nights are colder than you would imagine) so I can take off the blanket and I feel this will be just right. The feel of the material is soft even before washing and I love laying on it. The stitching so far is tight and has no ravels or loose threads and has withstood my toy poodle digging on the top of it to make a spot for herself. So for me this is a sturdy, well made bedspread. The shams are king but I bought one cheap king pillow to stuff into one of the shams and placed leaning on my headboard on top of my standard pillows and it looks great. Since this is a reversible spread you get a two-fer and the sham matches either side. One person said that it was a shame you couldn't use both sides of the sham but since I put a king pillow in it I do use both sides. The ties look cute and the pillow is totally encased and even if you cut off the ties you would be hardpressed to see the opening as it generously overlaps. Buy this spreadand enjoy the many colors for accent options. I bought the hopsack curtains in wheat to go with it and the look is stunning, better than I could have imagined. The texture of the two materials compliment each other for a cozy comfortable bedroom feel. Can't say enough about the quality of the bedspread and the price which I got on sale here. LOVE IT! LOVE OVERSTOCK! 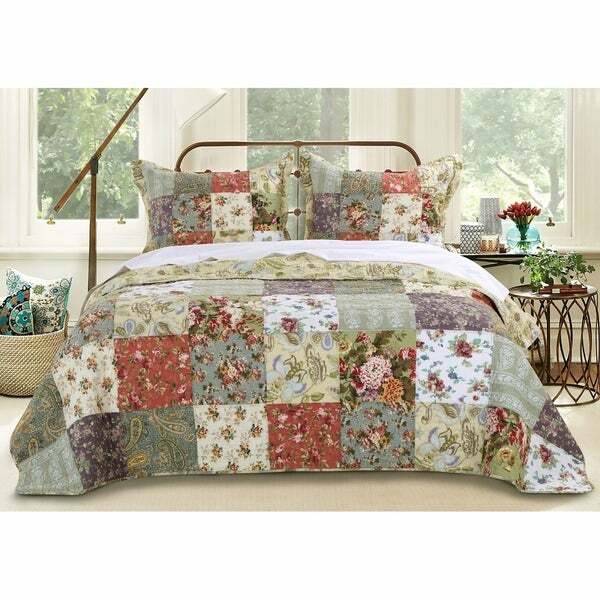 The Blooming Prairie quilt set is beautiful. Having purchased a 4-inch memory foam mattress topper, I needed a larger quilt or comforter to hang long enough to cover. After checking around in several stores, I went to O.Com and found this beautiful Blooming Prairie King Set with shams that works great on the bed and looks altogether stunning. Everyone who sees it is impressed and can't believe the low price at O. Thanks for offering such good products at great prices! This bedspread is a very good deal. The quality is outstanding considering the price. I would definitely recommend this bedspread to one and all. It is the first bedspread that we have purchased that actually covers the entire mattress and foundation. We love it. This is my 5th attempt at finding something to cover our bed, which is high off the ground, and has a deep mattress. Everything I purchased before this was too short, not wide enough, and just didn't make me happy. This quilt is extra long and wide and covers the bed just like I had hoped. It is well made, and is beautiful. I simply love it! My room is a dark sage green, and the colors in the quilt look beautiful in the room. Finally, I have a cover on my bed which makes me happy, and I am proud to show it off. We love this bedspread. Mixed it with the coral matching curtains and painted the walls a light beige greenish tint. Everyone loves the look! Elegant and sophisticated. This bedspread is wonderful. Nice and large so it hangs well over the mattress and box springs of my king sized bed. Colors are true and the patterns are elegant yet warm. I highly recommend this soft cuddly, tasteful, quilted bedspread. Love it!! All I can say is LOVE IT! It is hard in this day and age to find a bedspread. It's all about comforters and bed skirts. And the cost of a couple of King shams is exorbitant. I was thrilled to find both items together and at such a reasonable price. We live in a condo and since we are space impaired, we have a lot stored under the bed in plastic boxes. I was pleased that this spread hung down enough to hide that fact. The colors are true to the picture online. I am very, very pleased with my purchase. It totally brights up our bedroom. Have gotten nice copliments on this bedspread. Very pretty for a summer spring decor. Makes my room look light and airy. Good price on this product as saw elsewhere and cost was much more. Very impressed with the quality and construction of this bedspread, I liked it so much that I bought one very similar to it for my winter home. shipment prompt, as usual. The quilt is certainly big enough for a king-size bed, (always my concern) Beautiful colors and fabric- very pleased! This comforter’s colors are just like the one in the picture. We have an extra high mattress and this one fits perfectly. I have had trouble finding comforters to fit it, so that both sides we’re covered equally. 5his was definitely a great find at a great price. I really love this set, had been looking for a oversize cotton spread for my king bed for a while. The color patches are even prettier than the picture. Very happy with this set!! Colors are beautiful and it is not too heavy! I ordered the bedspread because my bed is high so I needed the coverage on the sides. I like my sides to be a little longer! I did cut the bottom off a bit and hemmed it, but could have used it without cutting off if I folded the top over the pillows. This was not a problem for me , so I still give this item 5 stars because I love this bedspread!!!! Beautiful! Prettier then the picture. Very well made and the colors are truer then picture. Highly recommend. Love. Love. Love. That's all! I love the colors, it's 100% cotton. Very nice. Lovely! Bedspread style, so you won’t need a bed skirt. What a beautiful bedspread set. I love the quality and colors of this quilt. I have recieved many compliments and many think it is a handmade Amish quilt. Just gorgeous and reasonably priced. "Are the dimensions given accurate? I am replacing a quilt size that I've had for quite a few years. I love this pattern so much and want to get a bedspread size for my newly purchased bed." Yes the dimensions that are on the sight are accurate. "Will the king size quilt on a king bed reach the floor?" I have 23 inches total from the floor of frame, box spring and mattress and it hits the ground on all sides nicely. A beautiful spread. It depends on the height of the mattress. If it is 15 inches from the top of the mattress to the floor the quilt will reach the floor. I bought the matching shower curtain and made a tailored dust ruffle. The squares are smaller on the curtain but once made and on the bed it looks just great. My bed is 25 in with pads and quilt ang I have a couple in. to the floor It works for me The quality is great! "Would this bedspread be considered as a Summer bedspread?" I love the bedspread but I think it is too warm for summer. It's pretty heavy, especially if it's king size. We use ours all year but in the summer it is usually folded at the foot of the bed. "Can it be dried in the dryer?" YES! I have a front loader and I have the King size. It takes several cycles of turning it because like all sheets and blankets it rolls into itself. Yes, it can be dried in the dryer. I didn't notice any shrinkage. This is an over sized quilt. I purchased a queen size one but ended up using it on the king mattress. Still plenty of over hang of material all 4 sides. "It doesn't appear heavy, but it is too heavy to sleep under, in my opinion." This is the best quilt I have ever purchased and I have several. For a quilt it is heavy and I love that it hangs almost to the floor. I have a king bed and have been looking for something that covers the entire bed. Great quality. I also purchased the small lap quilt. It is winter and I still have it on my bed. I don't know the exact weight but it is heavier than any bedspread or coverlet that I have. However I it not so heavy that I cannot manage it. I would not want it to be any lighter in weight. It is very nice when I am under it at night. I got the king size and although it is wider than most king-sized quilts, I would like it wider still. I have a tall bed and would like not to need to use a bed skirt.. I remove it, change linen and replace it by myself. So it is not so heavy that I need help to remove or wash it. I am very happy with the quilt and recommend it highly. "what are the colors in the bedspread?"